East Kilbride manager Billy Ogilvie is completely behind the decision to move their Scottish Cup tie versus Celtic to Hamilton's New Douglas Park. Kilby beat Lothian Thistle Hutchison Vale 2-0 to set up a home fifth-round tie against Ronny Deila's men, but K Park only holds around 500 people. "We want as many people in East Kilbride to see the game as possible," said Ogilvie about the 7 February game that will be live on BBC television. 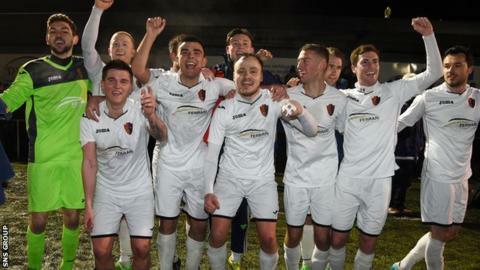 East Kilbride, who were formed in 2010 and play in the Lowland League, one stage below the Scottish Professional Football League, had been favourites to progress against their East of Scotland League opponents. But they will now be massive underdogs against the Scottish champions. "What a game for this club in its short, short history," Ogilvie told BBC Scotland after the final whistle. "It's just relief, but it was a fantastic cup tie. Our opponents, Lothian Thistle, were fantastic sportsmen. "The manager Raymond Carr came over and shook my hand and went round my boys and said all the best. I thought that was so commendable." East Kilbride whad already knocked out Highland League outfit Forres Mechanics and League One side Stenhousemuir before goals by Jack Smith and Sean Winter secured their place in the competition's last 16. "What a strike! It sat up nicely for Jack and he just volleyed it," said Ogilvie, a taxi-driver by day. "No goalkeeper, whether he be Scottish Premiership or anywhere, would have saved that. "Then Sean Winter was there at the right time and puts pressure on the goalkeeper and toe-pokes it over the line. "That was when we really felt a wee bit better. There was also a great one-handed save from my goalkeeper, Matt McGinley. "I'll have a day off tomorrow that is for absolute sure." Lothian Thistle Hutchison Vale had beaten Girvan, Kelty Hearts, Montrose and Huntly on their way to the last 32 of the Scottish Cup. Manager Carr was extremely gracious in defeat. "If you'd said at the start of the campaign that a club like ours was going to reach the fourth round, we would have taken it," he said. "The good thing is that a non-league team is going through. "They're going to make a bit of money and push themselves on with what they want to do. "Good luck to them. They scored the goals and they're through."